Reverse osmosis - taste the difference! 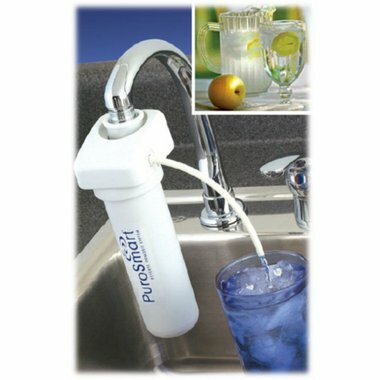 The PuroSmart® removes salts, lime, lead, bacteria and virus through reverse osmosis, a molecular separation technology. Due to it's Dow Chemical membrane more efficiently than many bigger devices with inferiour membrane quality. Extremely compact, suits ?in your trouser pocket?. Many times the only alternative for a single household. Mobile, mounts within seconds to the tap. Ideal for vacation, second domicile, short stays in hotel, travels. Very rugged. No maintenance - constant performance lasts for years. Economical. Only 0,025 EUR operation costs per liter. Constant permeat/drain ratio. No tank of rubber or plastic (best is glas or Lexan®). One of the biggest advantages of lime and salt reduction is the reduced surface tension of water and the increased dissolving and penetrating power of the water (compares to 95° C hot water), as well as the higher saturation and transport capacity. No more lime cleaning of vessels. Enormeous savings (lime is isolating, which produces considerable heating losses). Diameter: 5 cm, height 25 cm. Additional filter: Dirt strainer. Carbon pre and post filter. ATTENTION: Reverse osmosis filtration creates a back pressure! Do not operate reverse osmosis filters on pressureless continuous-flow water heaters (used in many old buildings and offices), because they become leaky immediately! New: drinking water canister PETG made of glas like special material, 1 gallon. Difference to Watmaker: The Purosmart is twice as fast, because it uses a Dow Chemical membrane, instead of a Hydronautics membrane. w-0024 PuroSmart® carbon prefilter 3 pcs. ich habe mir einen Purosmart besorgt. Es war keine Anleitung in deutsch dabei! Ich habe einen Leitungsdruck von ca. 3 bar und es tröpfelt langsam. ist das normal? » As a registered customer you can judge the review here. Please log into your existing account.